Confirming marker for Business Loop I-70 west posted after U.S. 50 and across from Whitman Park in Downtown Grand Junction. Photo taken 10/18/04. Following portions of U.S. 6 and U.S. 50 south of Interstate 70 through Grand Junction and Clifton, Route 070B totals 13.265 miles south from Exits 26 to 37. Business Loop I-70 is a controlled access, commercial arterial for much of its route northwest of Downtown along side U.S. 50. U.S. 6 coincides with the business loop from the northwest to a wye interchange with North Avenue by the Rimrock Marketplace retail area. 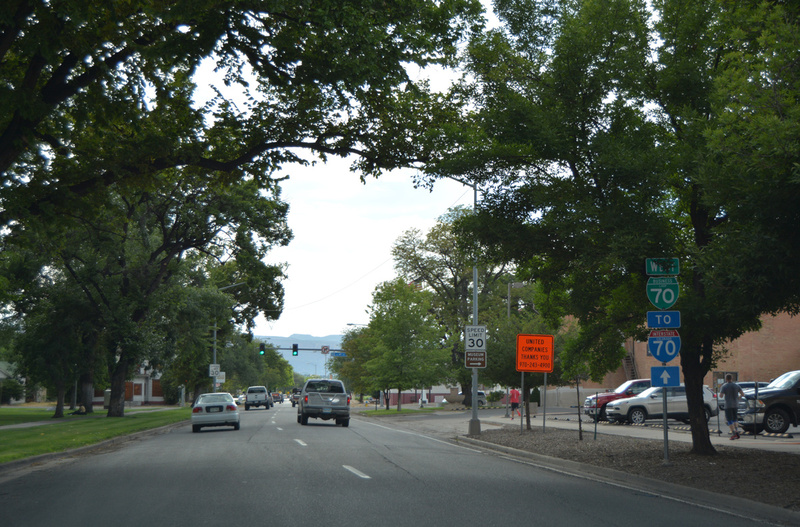 Through the business district, Business Loop I-70 follows a one-way couplet along Pitkin Avenue east and Ute Avenue west. U.S. 50 partitions with the route at 5th Street south. Northeast of Downtown, Business Loop I-70 follows a four-lane highway through industrial areas as it parallels the Union Pacific Railroad toward Clifton. U.S. 6 overlaps with the loop again from the east end of North Avenue to the Palisade/Mount Lincoln cut-off via F Road east. The business route turns north from there to end beyond a distributor center and subdivision at I-70.